The new Cornerstone Church campus is proof that good design is worth waiting for. 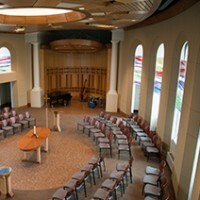 After three years of design and eventual construction, the new church facility opened to rave reviews and experienced an immediate jump in attendance. Congrats! What an amazing church multimedia set up Cornerstone has. My church has a led video wall and a Vista Spyder, I love having the large screen to see visuals during services. I can only imagine how engaging a service at Cornerstone must be with that set up.